This year marks the Lord of the Rings Online’s tenth anniversary, an arbitrary number, but quite an accomplishments considering that most MMOs don’t last as long. The developers decided to put together a scavenger hunt for players to reminisce about the good old days of LOTRO and its story in a similar episodic style to the Bingo Boffin quests. Each week a new set of quests unlocks and new rewards to boot. The event is scheduled to last until July 13 at which point the event will likely disappear forever return next year! This article is part of a series on the Anniversary scavenger hunt. Find out more here. What follows is a guide to find all of the points on the scavenger hunt for “Year one” (week one). There are three quests to choose from, but you only need to complete one to advance to the next “year”. However, you can complete all of the scavengers hunts if you are so inclined. I made a guide that will help you do just that with help from a hunter. There are deeds for finishing all of the scavenger hunts of one type (e.g., all the “Tales” quests). And the final reward for doing one quest for each year is a title, “Versed in Yesteryear”, a White Majestic Stag pet, a set of dragon armor and a matching dragon steed (different from the bartered dragon horse). The hunts have players scouring Middle-earth to complete, so Hunter taxis, Warden musters, summoning horns, travel skills and swift travel all play an important role. Also remember that the Stable-master map allows instant transportation for 2 mithril coins each. 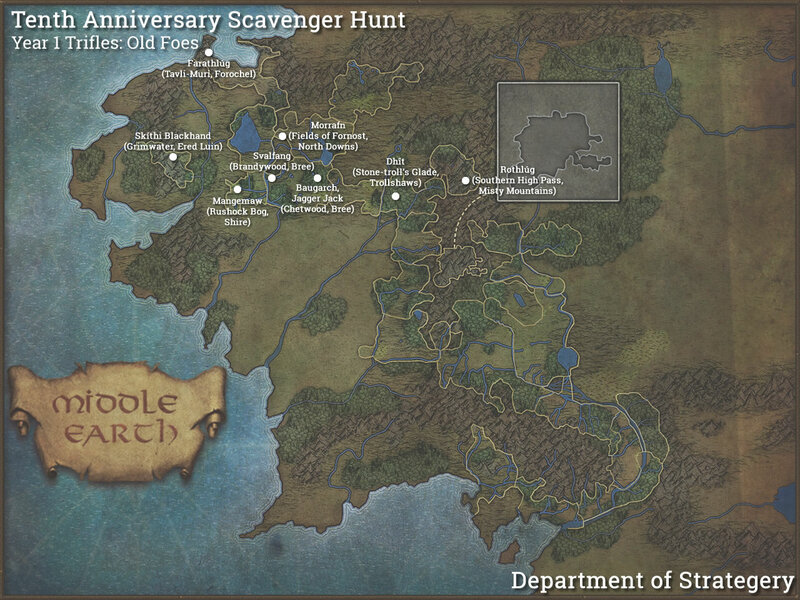 None of the scavenger hunt items are marked on the in-game maps, so this guide is for those of you who are too lazy (don’t be ashamed) to spend hours on Lotro-wiki. If at the end of ten weeks I have enough time and there is demand, I might consider plotting out a route to do all of the locations (30 quests). /Faint by the Ranger’s camp beneath Weathertop The foot of Weathertop, Lone-lands VIPs can take swift travel to his camp from Ost Guruth or Saeradan in Bree-land. Defeat fell-spirits in the Dead Marshes (6) Dead Marshes (Western Gondor) The travel horse in the Cave of the Avorrim outside Dol Amroth is Epic quest-gated but Captains can summon players level 85 and above. Visit the Bounder’s Bounty Statue Michel Delving, Shire 2 Rems. Visit High King’s Crossing Evendim 2 Rems. Visit The Dwarf-lords’ Gate Great Delving, Moria 2 Rems. Visit Argonath East Wall, East Rohan 2 Rems. Visit the Stone of Erech Blackroot Vale, Western Gondor 2 Rems. Visit the Cross-roads North Ithilien, After-battle Gondor 4 Rems. If you could, I think it would help if you listed how many Remembrances are at each location for the Towering Monuments. Thank you for what you have done, though! I didn’t keep track of those, but you should find 2-4 at every location. I agree with Diane, listing how many remembrances are at each location would be super helpful! I had to backtrack through the taverns for a bit because I hadn’t realized there were more than two at some of them. I’ll see what I can do to collect that information. These do help a ton..
oops year 2 was there already..:P appreciate your work! Oh yes. This is very helpful. I wonder if you could add the deeds associated with this event. I’ll try adding that info somewhere into this post. I am confused… I thought the Dead Marshes were up north west of the Black Gate, not in Western Gondor. Otherwise, fabulous resource. Thank you. There was a small interlude about Frodo and Sam’s crossing about the same time Western Gondor came out. I haven’t tried to defeat those corpse-candles in the Wastes yet to see if they also count for the quest. Can anyone confirm? I didn’t try myself but I highly doubt they count and Landroval chat says they don’t. These are other mobs imho, they are not named fell-spirits. You can go to Dead Marshes in the Wastes now but they aren’t mark on map, you need to know yourself. Earlier we could only go to Dead Marshes using a swift horse inside an elf cave by the sea near (somewhat east from) Dol Amroth. You need to go there to complete that part. Great guide. RL has managed to keep me from running the quests yet, but my main is a Hunter!!! Great work on the wiki so far! I’ll be adding links to those pages shortly. This is probably a dumb question (sorry) but I am assuming that these are not for lower level characters. 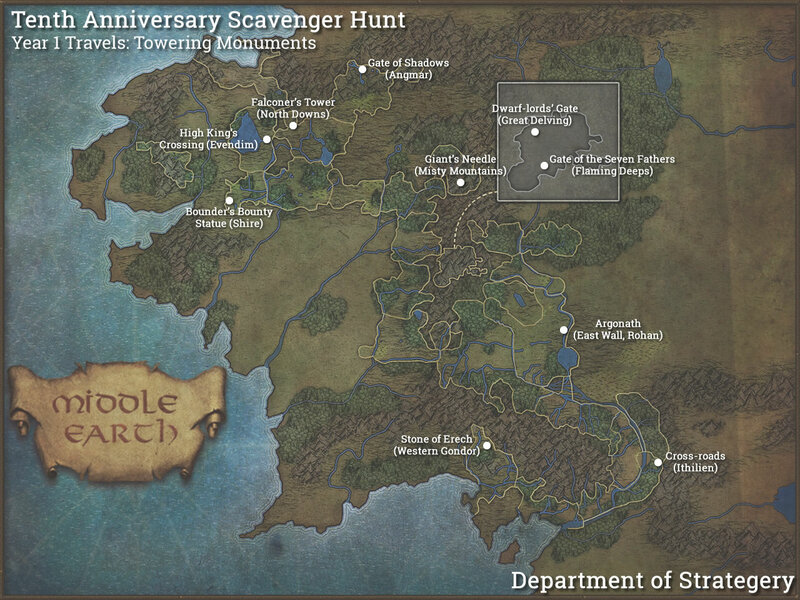 I’m pretty sure I’ll get squished if I try to complete the scavenger hunts in Gondor, Rohan, or the Dead Marshes at level 42! True, you can complete much of this with a higher level buddy, but I believe the Dead Marshes horse is gated behind a high-level epic quest. So to get the reward (Steed, armor, and pet) I only have to do on quest per year? So just 10 quests and that’s it? Or do i have to do three quests per year? 30 quest combined? The only thing you get by doing all 30 are three extra titles and some rarer dyes. The other cosmetic stuff can be got by doing one quest per year.